Generally when people think of bacteria, they think of burgers tainted with E. coli that can make you sick or the bacteria that cause a child's dreaded ear infections. However, our bodies are actually teeming with bacteria—they cover our skin and line our lungs and digestive systems. It is estimated that humans have 10 times more bacterial cells than human cells in their bodies. Some of these bacteria are indeed harmful—they directly make us sick or they increase the risk that we will get diseases like colon cancer or obesity. But others are actually helpful and can help prevent a person from developing an illness, like inflammatory bowel disease. A recently published paper explores another way that bacteria can be helpful: they can prepare the immune system to fight off viral infections. Michael Abt and colleagues in the lab of David Artis at the University of Pennsylvania found that antibiotic-treated mice had a much harder time fighting off two different types of viruses, compared to untreated mice. (In fact the antibiotic-treated mice were more likely to die when exposed to an influenza virus.) Additionally, macrophages—cells that play an important part in the immune response by chewing up pathogens and stimulating other immune cells—from the antibiotic-treated mice were dysfunctional even before the mice were exposed to any virus. The macrophages from the untreated mice had their defenses ready; they expressed certain genes that are important for launching an antiviral immune attack. The antibiotic-treated mice, however, had a lower expression of these genes and thus were less prepared to go to war with future viruses. In essence, the presence of bacteria helped keep the immune systems of the untreated mice in shape and ready to fight. 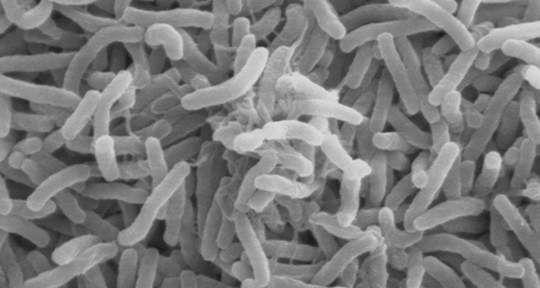 In their discussion, the authors reference a study that showed that giving probiotics (known 'helpful' bacteria) to human subjects decreased the length and severity of colds (but not their overall number of colds). I would be curious to see if patient data could show the reverse effect on patients given multiple rounds of antibiotics (or food animals chronically treated with antibiotics)—do they have more severe or longer-lasting viral infections? Would probiotic treatment help? Does breastfeeding—which helps colonize a baby's digestive tract with helpful bacteria—help fight off viral infections in babies given antibiotics? Regardless of the health implications, this paper is interesting from a basic science perspective. I like to imagine alliances between my immune system and 'helpful bacteria'—preparing for a possible viral invasion (but perhaps that's because I've finally been sucked into HBO's TV series Game of Thrones). Bacteria: you just never know what side they're on.